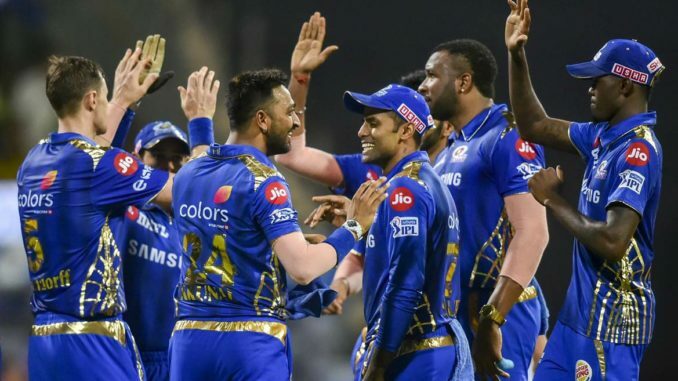 Mumbai Indians defeated Royal Challengers Bangalore by five wickets in an IPL match in Mumbai’s Wankhede stadium on Monday. Hardik Pandya single handedly turned the game in favor of MI after smashing 37 runs off 16 balls while chasing the 172 run target. Mumbai who needed 22 runs from the last two overs, Pandya got those runs within 6 balls off Pawan Negi, finishing off on the 19th over. Mumbai won their fifth game out of eight played, while RCB suffered their seventh defeat. Earlier, Lasith Malinga who returned to the squad picked four wickets for 31 runs as Mumbai restricted RCB to 171 for 7. AB de Villiers and Moeen Ali hit impressive half centuries to guide Royal Challengers Bangalore to a respectable 171 for 7 after being put into bat. Skipper Virat Kohli was gine early on 8, and opener Parthiv Patel too was dismissed inside the 7th over. AB de Villiers got 75 runs in 51 balls, along with Ali who picked up 50 off 32 balls resurrected the innings with a 95 run stand for the third wicket. Marcus Stonis was dismissed for a duck in the 18th over. While chasing, Mumbai were off to a flying start in their run chase with opener, Rohit Sharma got 28 and Quinton de Kock got 40.De Kock attacked Umesh Yadav, while Sharma wacked Mohammed Siraj. Mumbai immediately after the end of the first powerplay lost two wickets, off Moeen Ali. The off-spinner brought back RCB into the game by picking up two wickets. Mumbai were at 71/2 in 7.4 overs. Youngster, Ishan Kishan gathered 21 runs by smashing two sixes off Negi before he fell to Yuzvendra Chahal who got 2/27. Suryakumar Yadav and Kurnal Pandya were finding it difficult to clear the grounds, in the 13th over Chahal sent back Suryakumar to the pavilion. Hardik was nearly out in the 17th over but it was his elder brother Krunal who was out in the next over off the bowling of Mohammed Siraj. It was left to Hardik to take Mumbai to victory. Pandya’s 37 runs just did the trick for Mumbai to defeat Royal Challengers Bangalore.